This model of a Norton Sound kayak includes a full set of tools and weapons, all held on deck by sealskin cords. A seal dart rests on top of a float board, attached by a coiled line; the board was designed to drag behind a wounded seal, hindering its escape. A gaff hook and several throwing and thrusting harpoons are shown within reach of the boat’s cockpit, and a spare paddle is carried on the back. Wooden frames and seal-thong lashings gave kayaks great flexibility and strength to withstand rough water. Branson Tungiyan: You have the same kind of kayak? Jacob Ahwinona: Yes, it’s the same kind of kayak. Jacob Ahwinona: [The nose of the kayak] is a little straight, but it’s the same design. Estelle Oozevaseuk: Have you ever used one? Jacob Ahwinona: Yes, my grandpa used to make them . . . . My mother and other ladies, they put skins on them. My grandpa made the frames and then they sew all [the skins]. Aron Crowell: What is the process of making a kayak like this? Jacob Ahwinona: First my grandpa usually goes down to the beach side and collects wood for this bow and for the stern. He said [when] making Eskimo hunting gear, they usually go for driftwood. And they alter these ribs and stuff, they get them in our area from our willows that grow. But for straight keels they’d get the wood from the beach side. They use nothing but rawhide to make thisqayaq [kayak]. Bill Fitzhugh: Would he make a new kayak every year? Jacob Ahwinona: Depends on how you take care of it. If you take care of it right, it’ll last, but if you’re careless, then you need one almost every other year. If you can take care of your gear, well, it’ll last you until the skin on that thing should be changed. Aron Crowell: What kinds of skin were used, and how many? Jacob Ahwinona: The ones in our area, they’d put ugruk [bearded seal] skins on the qayaq. That’s what they used. Bill Fitzhugh: How did they bleach them? Jacob Ahwinona: When they want to make it [white], they soak it [in] urine. When they put it in that it turns white, but before they sew it on there, they’d put it in the water. Marie Saclamana: They’d take the hair off. Put it in a warm place. Branson Tungiyan: You have to check it every so often. Until you can feel that it is ready to peel off. Marie Saclamana: Yes, just peel it off. Jacob Ahwinona: And to take these out in the ice [during] wintertime, they got the sled here, they called quamugaurat [boat sled]; which goes under [the boat]. When he’s driving that over the ice on the quamugaurat, this hole [at the front end of the kayak], you can use that to steer your kayak around when you go from ice cake to ice cake, if you don’t want to go out in the water or out in the moving ice. Yes, that’s what that hole is for. You can grab it there. 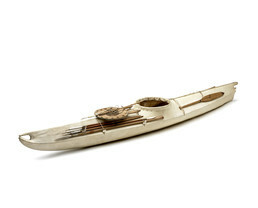 You got a strap [diagonal direction across the chest from shoulder to hip] and you pull that quamugaurat [boat sled] here and the runners on that quamugaurat are made of walrus ivory. Why? When you’re out on the ice, in the salty water and the ice, the snow won’t stick on that ivory. No matter how much weight your kayak is, you can go over without any problem without that snow sticking into your runners. But if you have brass runners on those, the snow will stick. That’s how come they have these ivory runners on their quamugaurat. Then when he’s ready to go out in the open water, he sets it down, puts that little sled on the stern end [of the kayak], and ties it on. Marie Saclamana: Is this Fish River style? Jacob Ahwinona: Yes, Fish River. Jacob Ahwinona: They also can use that in the inland, like for going out hunting. My grandpa used those when Nome first got miners out there. In the 1800’s on the lagoon; before there ever was any roads through that area, they used that qayaq to hunt the birds. All kinds of them: geese, swan, snow geese, emperors, mallards, everything . . . . And when they’re out seal hunting, when they catch ugruk [bearded seal] out there in that moving ice, they cut it up in pieces and then they stuff it in there, inside, back here, and then when they get to the ice, they can just pull up and put on that [ice]. That qayaq will hold three or four ugruks in there. If you got no more room in there, you can put them on top. But if you get caught [in a bad situation] you could throw them out. Each piece, you can empty your kayak. You can throw them out and save yourself but most Eskimos, they won’t throw that meat away once they get it. No way, not going to throw them away, they’ll risk their life to get that meat home! Estelle Oozevaseuk: Do you know anything about carrying a passenger in it? Jacob Ahwinona: You can take passengers in there if you were just going across¾you’re not out hunting but if you’re out and three or four, half a dozen people want to get across [the water] and you got one kayak, you can put a couple people in there and take them across there, and go for the other ones . . . . It takes a lot of work to take care of them though. You got to take care of that skin there, keep it away from the ground when you’re not using it. Keep it away from dogs, you know . . . .
Aron Crowell: Does it get damaged by ice when you’re out? I looked around and not a cloud in the sky, and I couldn’t believe him. So we turned around and went back. You know, before we hit that beach, that storm hit us. He took one look, just one look in that water in that edge of that ice, and he turned around and took me back. That’s how experienced those old timers are. They can tell you just by looking at that water or just looking at the sky, ‘Yep, we’re not going nowhere today.‘ That’s just the way the early Eskimos were. They can predict the weather. My grandpa taught me when I was a little boy always look at the weather before you go anywhere. Even now, the first thing I do is look at the weather, even if you’re not going out anywhere. So that’s the way it is. They passed on the traditional values of our culture. Branson Tungiyan: They did that too at Gambell, the experienced old men. What they’re looking at is particles in the water. If they’re inwards, then they say it’s safe to go out on the moving ice, but if those particles are moving outwards, they can’t go into that moving ice. Aron Crowell: It means the ice is going to separate from the shore, right? Branson Tungiyan: And the winds will pick up. That could cause the ice to go out and catches the hunter and takes him out to sea. Jacob Ahwinona: See, these are unaaq [ hunting implement attached to kayak]. Ice picks for overnight ice . . . . When that ugruk [bearded seal] is in the water, he’ll use that harpoon, see, but never ever tie it to your kayak because you never know if that ugruk is alive or not. If there’s no movement, you can pull it right there and then go on shore and pull [the seal] out of the water . . . . It’s got a single paddle. They used to have both [single and double paddles]. Some prefer double. But most of them prefer a single. Why single? Because it’s easier to put it away than the double ones, if you’re in a hurry. But on a long stretch of water if they’re not hunting, that double works faster than the single one because you got to turn it over on this side. Marie Saclamana: Is there any string around that hole? Jacob Ahwinona: Yes, and then they got rain gear. When you sit there, you got the rain gear, seal gut rain gear that you can tie around [the waist]. And if you flip over in the open sea, you don’t get any water in there. You can come back up and go some more. The waves can flip you over but you can come back up. You never get water inside that kayak. In Traditional Life on King Island, Margaret Seeganna said that “every man, young or adult, owned his own kayak, and these skin-covered canoes were considered essential for survival.”(4) Kayaks were usually made by “older men who had stopped hunting and could devote a great deal of time to their art.”(5) Hunters who commissioned kayaks usually supplied the materials. The kayak builder measured the “height, weight, the length of each arm, the distance from elbow to fingertips, and the distance from fingertip to fingertip with arms outstretched” of the future owner in order to make the boat specifically fit his size. Men hunting from a kayak carried an assortment of specialized equipment. Darts, harpoons, lances, a boat hook, and extra paddle were secured on the kayak deck under sealskin cords. Ivory, bone or antler projections called spear guards helped to hold these items in place. (11) In the Norton Sound area, single-bladed paddles were more common than a double-bladed ones. When not is use, kayaks were hauled onto land and oiled to keep the skin in good condition.